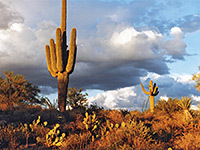 At 2,969,602 acres, Tonto is by some distance the largest of the six national forests in Arizona, and has the most interesting, diverse scenery, with terrain and elevation ranging from the Sonoran Desert (1,400 feet) to the Mogollon Rim (7,400 feet). Besides desert and mountains it contains lakes - mostly artificially created, fertile river valleys, rocky canyons and flat plains. 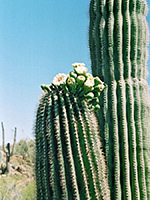 Much of the area is covered by cacti, in particular the familiar giant saguaro, but there are also dozens of smaller species. 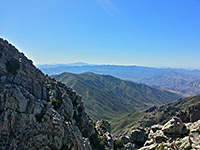 The cactus colonies merge with bushes, chaparral and grasslands above 4,000 feet, while the higher hills to the north support varied woodland habitats including juniper, mixed fir and ponderosa pine. 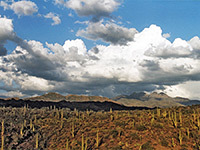 Tonto National Forest contains eight separate wilderness areas, all of which have quite limited access as the land is generally steep and rough, without many trails, and experiences harsh weather for most of the year. 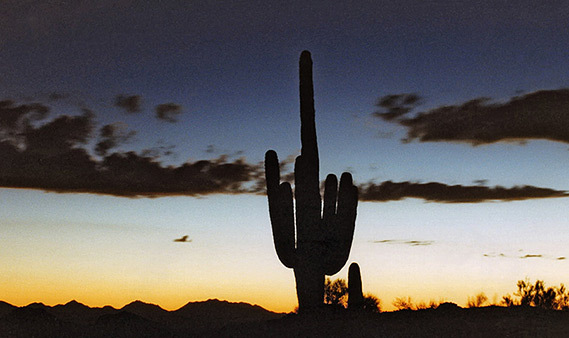 To the southwest, the Tonto National Forest boundary follows close to the edge of the Superstition and New River Mountains - beyond stretches the low, flat desert, the ever-expanding city of Phoenix and the 'Valley of the Sun'. From Phoenix, I-17 runs north through the Agua Fria River valley, with the edge of the forest a few miles to the east; this extends for about 40 miles, past Agua Fria National Monument as far as Cordez Junction. 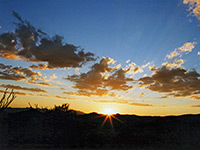 Tonto is then bordered to the north by the Prescott, Coconino and Apache-Sitgreaves National Forests, and to the east by the Fort Apache and San Carlos Indian Reservations. The northern boundary is defined by the Mogollon Rim, a 2,000 to 3,000 foot high escarpment that forms the southern edge of the great Colorado Plateau, which stretches for over 100 miles across central Arizona. Few paved roads penetrate this vast area; just AZ 260 across the north, US 60 across the south, AZ 87 from Phoenix to Payson and AZ 188 from Globe to AZ 87. There are a selection of lesser roads, most well known being the Apache Trail between Mesa and Theodore Roosevelt Lake, through the Superstition Mountains. Roosevelt is the largest of the man made lakes; others are the Saguaro, Canyon and Apache Lakes, Bartlett and Horseshoe Reservoirs. 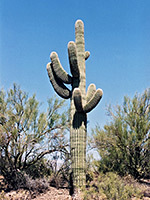 Towns with hotels near the Tonto National Forest are Apache Junction, Camp Verde, Gold Canyon and Payson.